I FOUND..... 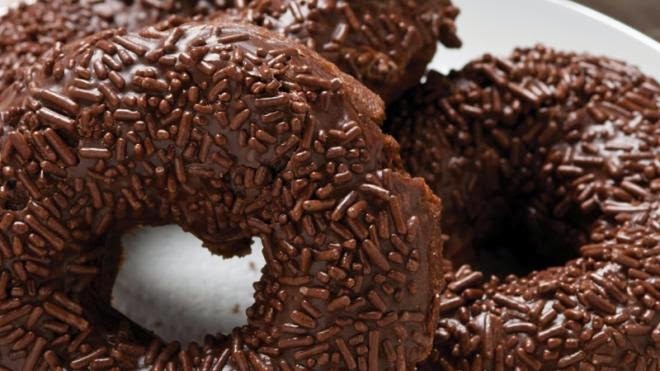 The darkest and richest chocolate Donuts RECIPE. Blackout Donut .WOW!!! In a bowl, whisk together 2 cups of the flour, cocoa powder, baking powder, salt and baking soda. Set aside. In mixer bowl fitted with paddle attachment, combine brown sugar, eggs, milk, butter and vanilla. On low speed, mix until well combined. Add dry ingredients and mix until incorporated. Gradually mix in more of the remaining flour, as necessary, until dough starts to come together and is the consistency of biscuit dough. Cover and refrigerate for 10 minutes. Meanwhile, in a large, deep pot or deep fryer, heat about 4 inches oil over medium heat until temperature registers. Tip: Be careful not to over fry chocolate cake donuts. On a floured work surface, roll out dough to slightly thicker than 1⁄4 inch . If dough is tacky, dust with additional flour. Cut dough with cutter into 18 donuts, re-rolling scraps as necessary. Place at least 1 inch apart on prepared baking sheet. Deep-fry 4 donuts at a time in hot oil, turning once with wooden chopsticks, until puffy and firm, about 25 seconds per side. Using a slotted spatula, transfer to paper towels to absorb excess oil. Fry remaining donuts, adjusting heat as necessary between batches to maintain oil temperature. Let donuts cool completely before icing, Chocolate sprinkles and chocolate frosting will complete this job.